If you are visiting Burdisson Brewery, then it’s likely you already know good beer. Since the time of our founder, Borrdar Burdisson, this brewery has prided itself on producing some of the finest beer anyone could have in a lifetime. Our commitment is solid, and our resolve to continue the work set forth by our ancestors is firm. But what makes a good beer? Ingredients only go so far, truth be told. Here at Burdisson Brewery we believe our beers are what they are because of tradition. A tradition that says, “We forge mighty good ale.” So welcome to the brewery. Have a good look around, and take it all in. Drink some beer, sit and talk to our brewers, and if you’re lucky you might have another experience like this once more in your lifetime. The first of many to come, Burdisson’s Dwarven Ale is the legendary brew that started it all. 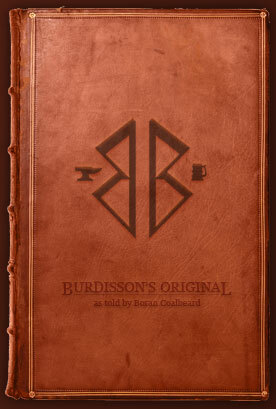 Originally known as the Mines of Logann, what today is known as Burdisson Brewery was founded over 1100 years ago by Borrdar Burdisson, a visionary Brewmaster who united his clan towards a single purpose. That purpose was to brew the best beer in all the dwarven lands and beyond. Where others saw only a used up old mine (The brewery, as pictured above, was actually once a coal and copper mine! ), Borrdar saw a new home and a new direction for his people. So with a little luck and a lot of hard work, the Burdisson’s eventually renamed the Mines of Logann into the Burdisson Brewery, their home. The old coal mines and the surrounding lands all underwent a massive transformation over the first few centuries. Farmlands, now rich and verdant, required decades of cultivation and shaping. Massive waterway aqueducts were constructed to bring the mineral rich water of the high mountains into the plains below the brewery. The work of becoming a truly independent entity was not realized until after Borrdar’s death. The Burdisson’s were saddened at the death of their strongest leader in centuries, and they were galvanized into forging ahead. Before the brewing could get underway, the Burdissons had to first ready the land and invest in the machinery required for large-scale brewing. Some of the brightest minds in the dwarven world, most of them Burdissons, were consulted and contracted to work on the project. Many new breakthroughs in steam technology, now commonly seen in machinery across the world today, originated from the work directed by Borrdar Burdisson. While work on the brewery itself commenced, another division of the clan was hard at work developing the surrounding lands into the farmland and other industry essential enterprises that would be needed if the Brewery was to be independent. This included acquiring timber and excavating large portions of the exhausted coal mines for stone used in new construction. Though the Brewery was not completely independent when Borrdar died, Burdisson’s Dwarven Ale was already a recognized label across much of the surrounding lands, and it was growing in popularity. For the Burdisson’s, it came as a great celebration and a great sadness that only ten years after Borrdar’s death the Brewery gained full independence. The last of their farming and shipping efforts were brought online, and the new Brewmaster felt that they no longer needed to import any materials essential to the brewing and distribution process. Borrdar’s dream, over 150 years in the making, was finally realized. Brewmaster after Brewmaster instituted policies that helped the brewery grow in popularity, renown, and, most importantly, in quality. Burdisson’s Original, Borrdar’s now famous and time-honored beer recipe, was heralded throughout most of the surrounding kingdoms as the gold standard for what a beer should be. The Burdissons did their best not to grow complacent, however, and have continued to wow beer drinkers with many colorful and unique seasonal beers. As far as the Burdissons are concerned, this is the Age of Beer. And they are at the forefront of the movement. Among the oldest breweries in existence, Burdisson Brewery is unique in its approach to brewing, labeling, and distributing beer. Many attempts have been made, by dwarf and human alike, to replicate the success of the Burdissons, but no one has been able to create a fully independent and cohesive operation quite like Burdisson Brewery. Boran Coalbeard is a renowned beer connoisseur, known chiefly for his exquisite tasting events and several published books concerning the art of beer making and highlighting brewers from all over Kirfaël. A trained brewer, Boran has always had a much larger thirst for adventure than for brewing, and he has taken his expertise in the field on the road with him, learning as he had traveled. Often traveling at the head of a caravan or a wagon train, Boran is known for bringing the best beers and newest novelty drinks along with him in his travels. He enjoys sharing his finds with other enthusiasts, and it is widely known that with Boran Coalbeard’s arrival a drinking festival is sure to commence. Boran recently visited the Burdisson Brewery write a stand alone piece, a warm up if you will to his upcoming tour. Read about his visit to the Burdisson Lands and keep watch out for his upcoming project, a Gazetteer outlining of some of the best beers in all the land. Get the latest news on availability, promotions, and discounts. Copyright © 2011 Fantasy Brewmasters, LLC. All Rights Reserved.